Hayao Nakayama (中山 隼雄) is a Japanese businessman and served as Sega's president from 1984 to 1999. He also worked for Microsoft Japan and Virgin PLAY and was former CEO of Cavia (later AQ Interactive) and Pasona. He is currently CEO of Amuse Capital. His son Haruki Nakayama is president of Marvelous. Hayao Nakayama was in charge of arcade distribution company Esco Trading when Sega acquired it in 1979. He subsequently became part of Sega's management. 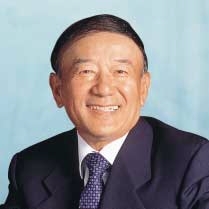 He was instrumental in helping David Rosen and Isao Okawa reclaim shares of Sega's business from Gulf+Western, allowing Sega to trade as an independent company in 1984. He subsequently became the president of Sega. Nakayama was one of the driving forces behind the Japan Amusement Machine and Marketing Association (JAMMA) organisation, becoming one of the group's first vice presidents when it was formed on January 1, 1981. Nakayama became vice chairman of the board of Sega directors in 1998, giving up his presidency role to Shoichiro IrimajiriMore.... Being more of an arcade-centric mindset, his new role put him in charge of the company's arcade divisions, having come under criticism for his handling of the home console business and the failed merger with Bandai in the years prior to this job change. Expression error: Unrecognized word "styl".Expression error: Unrecognized punctuation character "�".Expression error: Unrecognized word "styl".Expression error: Unrecognized punctuation character "�".Expression error: Unrecognized word "styl".Expression error: Unrecognized punctuation character "�".Expression error: Unrecognized word "styl".Expression error: Unrecognized punctuation character "�".Expression error: Unrecognized word "x". Expression error: Unrecognized word "styl".Expression error: Unrecognized word "more".Expression error: Unrecognized word "styl".Expression error: Unrecognized word "more".Expression error: Unrecognized word "styl".Expression error: Unrecognized word "more".Expression error: Unrecognized word "styl".Expression error: Unrecognized word "more".Expression error: Unrecognized word "x". Main article: Hayao Nakayama/Magazine articles.